I’m just going to come out and say it. I think these pants make me look skinny. And, I’m going to say it because I haven’t said that about pants in at least five years. And, I’ve NEVER said that about pants I’ve made. These pants are *magic*. I had an idea about making a tuxedo after I made the bow ties. I was wearing one out as a necklace and had several men (none keepers, but whatevs) complimented me. I figured a tuxedo might be a nice way to work more into my wardrobe. Especially since Liz and I were launching Baltimore Bespoke Bows this summer. I’m wearing them with my BWOF 1-2008-105 blouse from two / three years ago. Except, I forgot I HATE making pants. I love them in theory, but, they do not love me back. As noted earlier, I made half a dozen muslins of a straight legged pair and gave up becore moving to these. I bought the fabric from Guss Woolens in downtown Baltimore when Trena visited a few weeks ago. Mike, the owner, suggested the wool / poly hopsack weave at $8 a yard. It nicely resists wrinkling and presses wonderfully. It’s a little thinner than I would have thought a tuxedo material should be. But, it breathes so nicely! The satin accents are from A Fabric Place in Mt. Washington, Baltimore. I think it was $10 a yard. 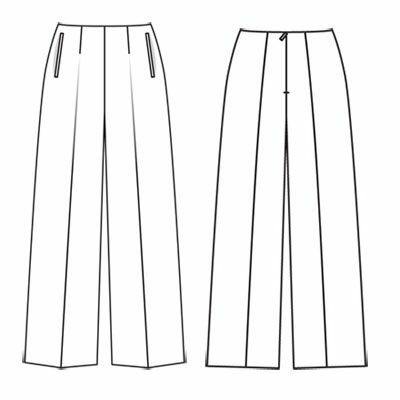 The original pattern from November 2010, #129 does not call for a waistband and has no side seams. But, I wanted a satin waistband and pockets — like traditional tuxedo pants. So, I used the top twp inches of the pants to make a waistband. 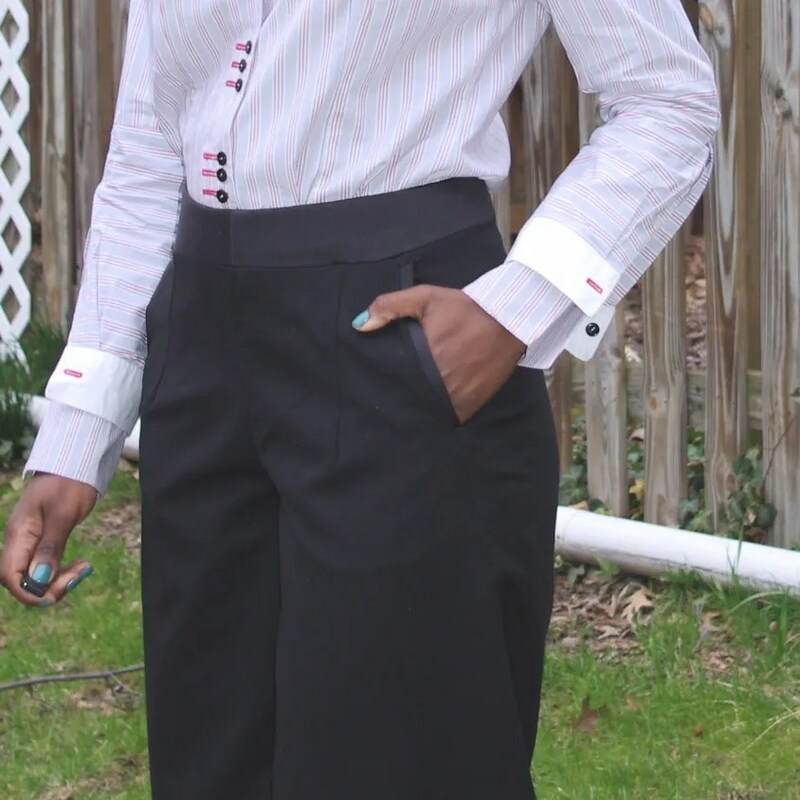 The lack of side seams made it tough for me to add a satin stripe down the side of the pants. But, I think it’s ok. I did not do additional pockets on the back. But, I would next time. The only alterations I made were a swayback adjustment and adding 1/2 inch at center front. But, the waistband still dips a bit and I’d like to adjust that in the future. 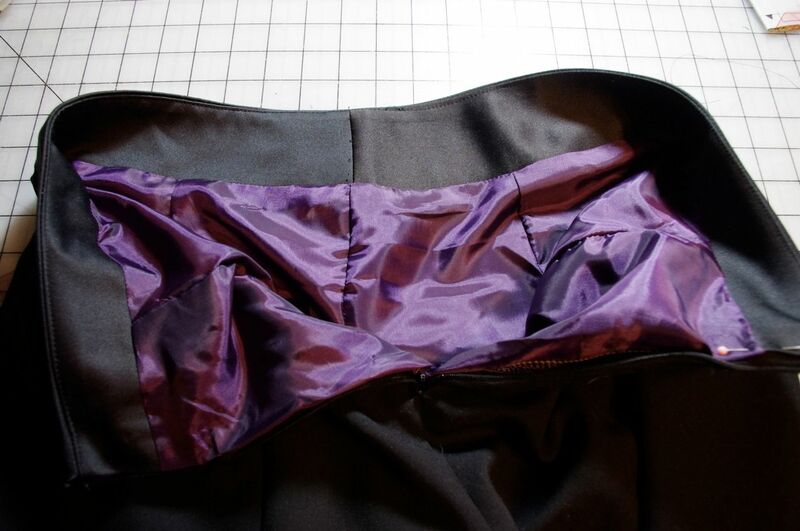 I used twill tape along the upper waistband seam allowance to prevent stretching. This was my first time using Kathleen Fasanella’s tutorial on making single welt pockets. And, I was so thrilled with the results that I made a donation. She puts out impressive, industrial method tutorials. I know we all think the internet is free, but people’s time and knowledge is valuable and making a small donation is a tangible way of saying ‘thank you’. I still love wide length pants. They are snug around my smaller hips and waist and gloss over my full thighs. 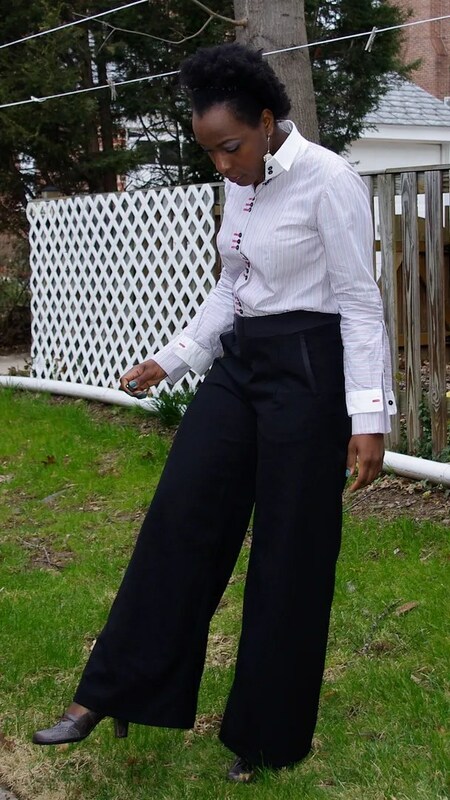 Plus, wide leg pants don’t get caught on my chub rub and give me as angry wrinkles in the back. I’m a third a way through a matching tuxedo jacket. I didn’t make a muslin so I have that same feeling of trepidation when I started sewing my wool trench coat. I may slow down as I really really want a matching puple Bemberg rayon to line the jacket with and have none on hand or locally available. We’ll see!